How to Keep the Best Humidity Level for Musical Instruments. How to Keep the Best Humidity Level for your Musical Instruments? See How Well Music Sorb Works for your Wood Instruments. Music Sorb looks like a typical desiccant, but it is much more. Keep your wood instrument in the perfect humidity range and we tested it. 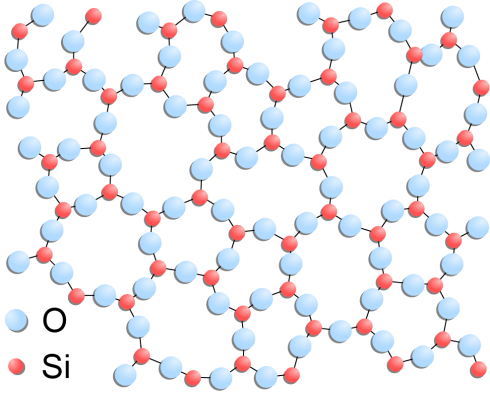 Music Sorb looks like simple desiccant products that only absorb moisture, but it is definitely not. Music Sorb technology allows the release of adsorbed moisture, unlike a typical desiccant. Once the relative humidity (RH) drops below the 50% range, Music Sorb units increase the release of humidity up to a maximum release pick for RH dropping down to 40%. On the other end of the RH scale, Music Sorb begins the adsorb process when the humidity exceeds 50% and accelerates the process, not to allow the moisture to be more than 60%. 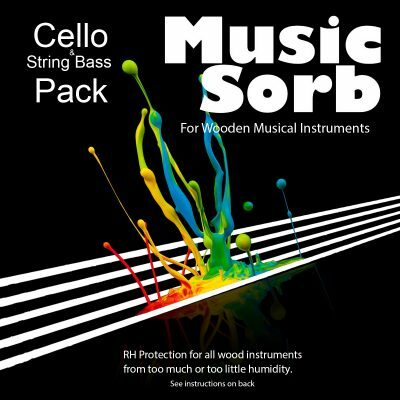 More, the buffering action performed by Music Sorb is constantly protecting the wooden structure of your musical instruments from stress caused by sudden relative humidity changes. 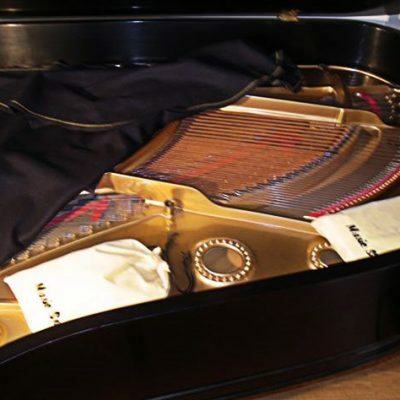 An appropriate amount of Music Sorb in your musical instrument case or piano can thus help provide the best humidity level for musical instruments to keep it in tune and protected. The Buffering Action on Relative Humidity by Music Sorb Technology. The Summary Chart of relative humidity data collected in our tests. Although Music Sorb graphing of statistics where we show the weekly measurement of humidity can be a bit difficult to assess, the graph to the right is a summation of all the statistical measurements in an attempt to give the best visual expression of the results. Here is what you are seeing. This line indicate the mean humidity for all the tests. This value was about 48% RH. This mean value is true for much of North America. This is showing the range of outdoor humidity for the whole period. The values ranged from 30% to 80% RH. This orange line shows the indoor humidity range for the whole period. The value of relative humidity in the rooms where the pianos were situated, ranged from 30% to 70% RH. This yellow line shows Music Sorb buffering action at work. 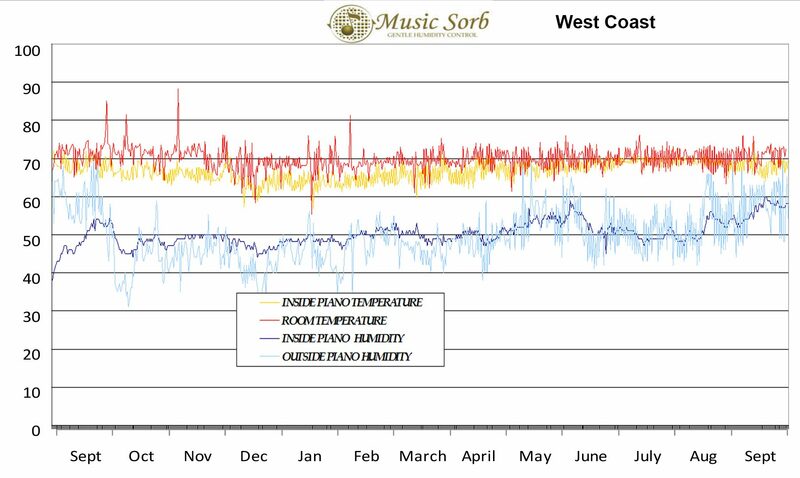 Within the pianos or the case in which Music Sorb was placed, the relative humidity values ranged from 41% to 55%. Summation: The conclusion to be drawn is the Music Sorb reduced the humidity range to which the piano was exposed to an acceptable variation according to wooden instrument creators and constructors. The benefit to pianos, guitars, violins, violas, cellos, and string bass is far less tuning and wood damage. The above test results were gathered from the application of Music Sorb to vertical pianos. The data is even more impressive when one realizes how open a vertical piano case really is. 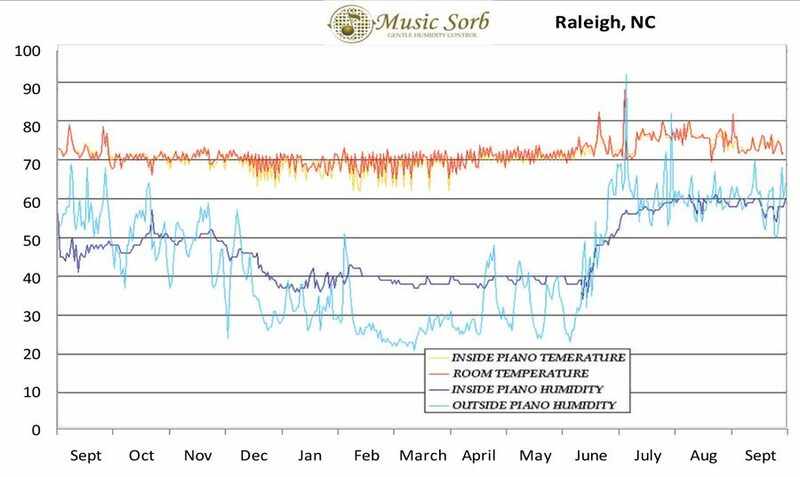 In North Carolina, it is interesting to note that for a two month period between the first of January and the first of March, even though the humidity was down in the twentieth percentiles in these colder months, Music Sorb held the humidity close to 40%RH inside the piano. Because a musical instrument case is much tighter than a vertical piano, Music Sorb’s effects are achieved by smaller Music Sorb units.